Have you ever written a loop or a multi-step procedure during which you would have liked to keep your user appraised of your process? Are you dissatisified with just changing the cursor to an hourglass to inform your users that a time consuming process is executing? If so, then this article will provide you with a couple of alternatives. Access provides us with several built-in methods for informing our users about ongoing processes. a. Docmd.hourglass - This method allows you to change the cursors image from its default to an hourglass, or change it back. or a status bar in the lower right corner with optional text displayed in the center of the status bar. This technique avoids the screen repaint problems associated with the Echo method but has the same visual drawback; nothing draws your users eyes to the status bar. For this reason, I find both the Echo and SysCmd techniques to be of little value. 4. Finally, because none of the previous methods are very visually stimulating, I created a form which I use whenever I am executing a multi-step process or a loop during which I want to provide feedback to my users. This is not a new idea, Microsoft and other software companies have been using a similar technique for years for their installation processes, I just modified it for use in my Access applications. The attached mdb file contains frm_Status, which contains all the code necessary to implement it within your applications. It also contains another form frm_Example which provides an example of how to use the status form. Frm_Status provides you with the ability to provide process status for a single process, or for imbedded processes. In frm_Example, I have given you the ability to see how the code works with both processes. I also provide an example of how to set the form up to display a Cancel option, and how to implement that within your application. 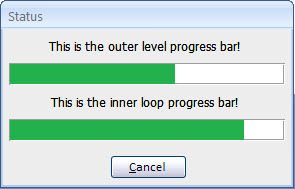 PctComplete: a number between 0 and 1 which provides the necessary information for determining the width of the progress bar. The progress bar will not display if the value of PctComplete is < .005. When the PctComplete value exceeds .999 the message and progress bar will disappear, leaving a “Done” message and a Continue command button. If the Continue button is not pressed within five seconds of being displayed, it will be automatically be activated and the form will close. This second status bar will not display if [PctComplete] is < .005 or > 1.005. You can tweak these values as you see fit. This will make the cancel button visible on your form. If the user clicks the cancel button, it sets the Tag value of the form to -1. This will not do you any good unless you actually test for this value in your code. The code segment below (from cmd_Generate_Click) shows how I test for this value in my loop. This form is modal and popup, so when you activate it, it gets the focus and you will not be able to leave it until your code passes the StatusUpdate function a PctComplete value greater than .999. You should probably include one of the following as the last line in any procedure that calls this form. I have also included a bypass function to allow you to close the form manually, in the event that you forget to include one of these steps or that your code somehow bypasses them. If you need to manually close the form, click on the form and press the F12 button. This will immediately close the form, but if your other code continues to call it, it will pop back up.